The day started with packing, wondering how much the suitcase would weigh (53lb). So for Vietnam I am told 44 lbs. Might just have to put some stuff in the carryon. Airplane travel can best be described as painful, small seats, cramped legroom, little or no food service. Traveling from Pittsburgh I boarded a small 50 seater to Detroit where I experienced perfect connection planning. Plane taxied up to gate B2, next flight leaving in an hour at gate A66, two opposite ends of the airport, same carrier mind you. That was a long and quick walk, and I arrived at the gate just in time for boarding. Long flight to LA, seat-side screen didn’t always work, movies were $6, so I just relaxed and began the process of planning to capture the return to Vietnam of 11 Navy Seabees. There is a special guest going with me on this trip. 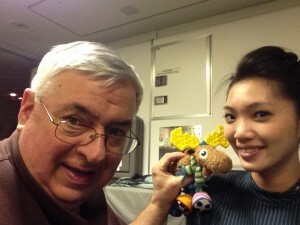 This guest is my grandson’s favorite toy, Moosey Moose. Now Andrew is only 5 months so Mom and Dad put him in my backpack. I discovered it when looking for my boarding pass. I can tell you it brought a tear to my eyes. 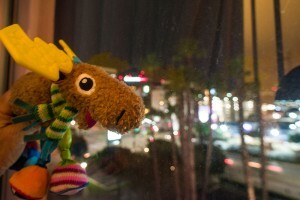 So you will be seeing pictures of Moosey Moose as he travels with me to Vietnam. On the technical side, cameras and gear are split between checked bag, backpack and small location backpack. When I get to Vietnam I will put my daily cameras, batteries and memory cards in the location backpack for use in the field. I am hoping that I can send a few comments everyday to this blog, but you know how that goes. I don’t know how much internet connectivity I am going to have in Vietnam. So stay tuned and check back often. Tomorrow, 14 1/2 hours to Taipei, then 4 hours to Hanoi, lots of flight time. Flying in those cramped silver tubes is becoming more an unfriendly experience. It’s not the people, it’s the confined spaces. If only we could have 6-8 inches more between seats. So the flight to Taipei was uneventful. The flight attendants on EVA airlines were wonderful, the even put up with my stories and one even posed with me and Moosey Moose. The landing was amazing, we almost didn’t realize we were on the ground. Now that was a different story from Taipei to Hanoi. We hit the ground pretty hard but made it safely. A gate change 30 min before we departed had us hustling from one end of the airport to another. Lots of people, mostly women, wearing masks. 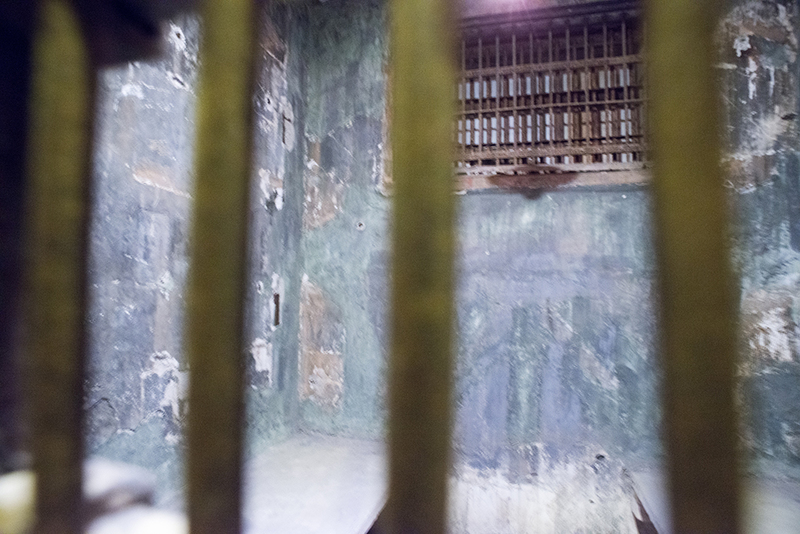 One of the cells at the Hanoi Hilton. We stopped for lunch then headed to the Hanoi Hilton to see where so many American POWS were held. 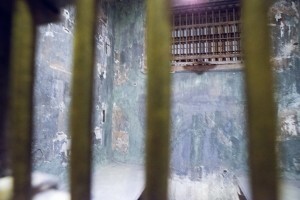 Quite an experience and to realize this prison has been in use for hundreds of years. 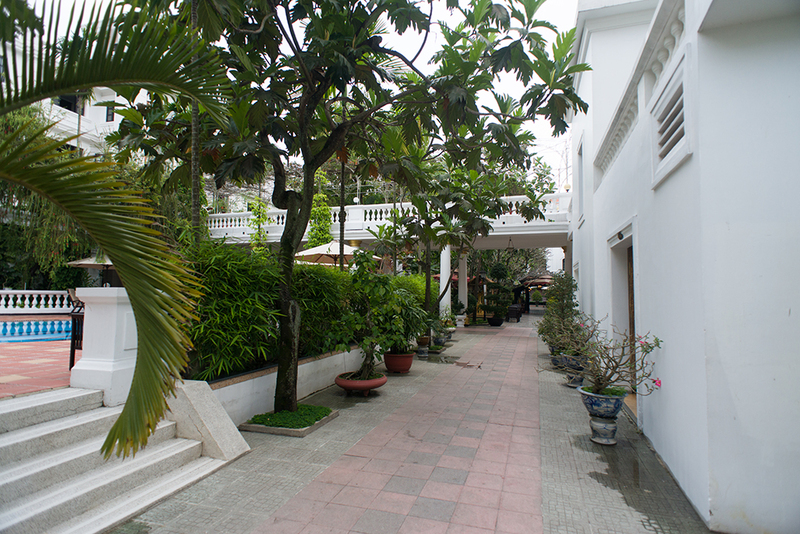 After settling in at the hotel and a much needed shower, we went to dinner at a traditional Vietnamese restaurant. More on the food in a later posting. The mausoleum and display of Ho Chi Minh’s body. 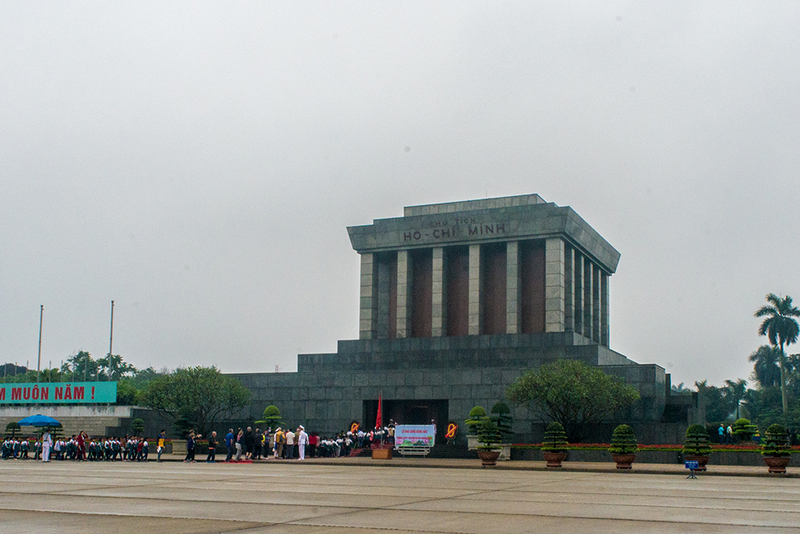 Overnight in Hanoi and a quick breakfast, we were off and running to the Ho Che Min memorial, So many people, lots of school children who visit up to 4 times a year. No pictures permitted inside, they are really good at sensing you are tying to sneak in a camera. Ho’s body lies in state, face and hands lit thru a class coffin. Quite a site, and very hushed tones, without even being told to keep quiet. Photography at this stage of the trip is beginning to take shape, alternating between video and still mode on the Nikon D800. GoPro also being used. So many others on this trip are taking pictures, so there should be plenty. Plaque marking the stop where John McCain was pulled from the lake and made a POW. A trip to the lake that John McCain crashed his plane and a small monument to this event. If you didn’t know it was there, you would miss it. 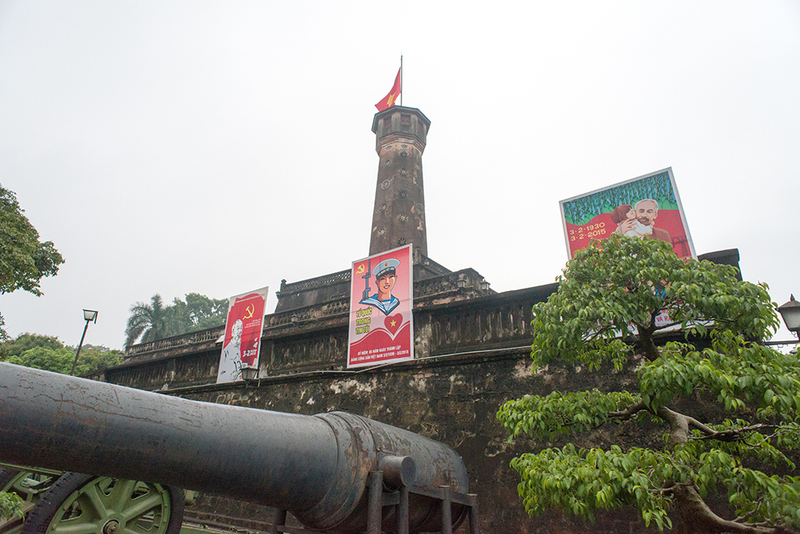 Pictures from that event are in the Hanoi Hilton location. Visited a series of shops run and created by people with disabilities. Some nice things, and helping those in need. I didn’t have my camera with me to take a picture of the sign. It said “Helping people who are defective,” I think they might have meant it to say disabled. Picked up a few things for my children, I hope they will like the surprise. 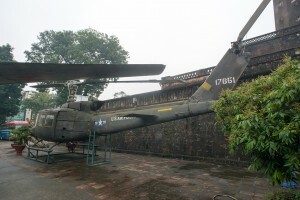 A trip to the war museum was interesting, a few “captured” items, it was a nice place to see a lot of the history of Vietnam. The lettering on the “captured” American planes and equipment seemed a little misplaced. Off to the new airport at Hanoi, domestic side four this flight on Vietnam Air. From what we understand Vietnam Air is a government airline, much like Amtrak, but it appears to be efficiently run. Moosey Moose had a nice time watching all the people at the airport. So many people, carrying boxes, suitcases and some very eager to get to the gate. Made it thru very easily, got a late start, some sort of mechanical problem. We left an hour late and it appears to have been the first time this pilot was at the controls. Take off was scary, and landing even scarier. 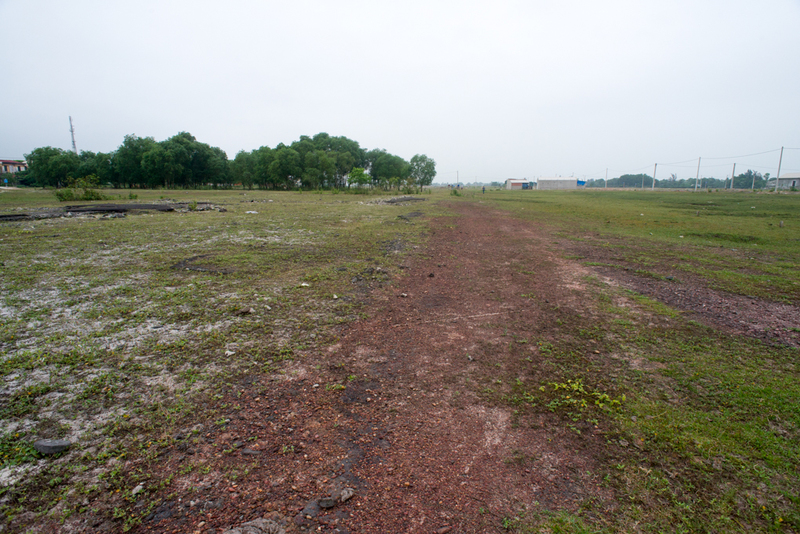 We kind of skidded when we landed at Hue. Thought for a moments we might be tipping over, yep. Life on a government run airline, though I have been told they are getting better. One casualty to report, the trail mix with lots of fruit, turned into a gooey mass blob. Remember that when you are packing snacks, especially in tropical climates. 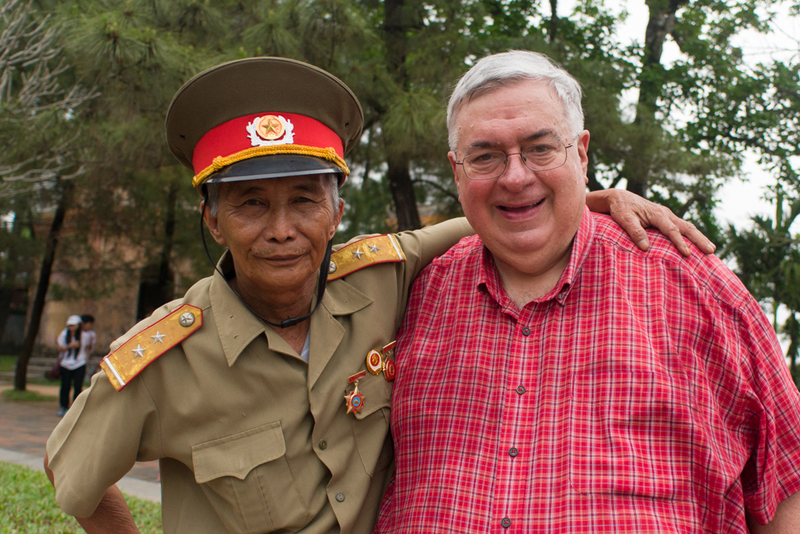 After lunch we met our new guide and driver and headed off to discover the old areas near Hue that were the camps. We stopped at a school and the children flocked to me like I was a Buddha or something. They all asked my name, I asked them theirs, I tried to pronounce the names, they laughed. 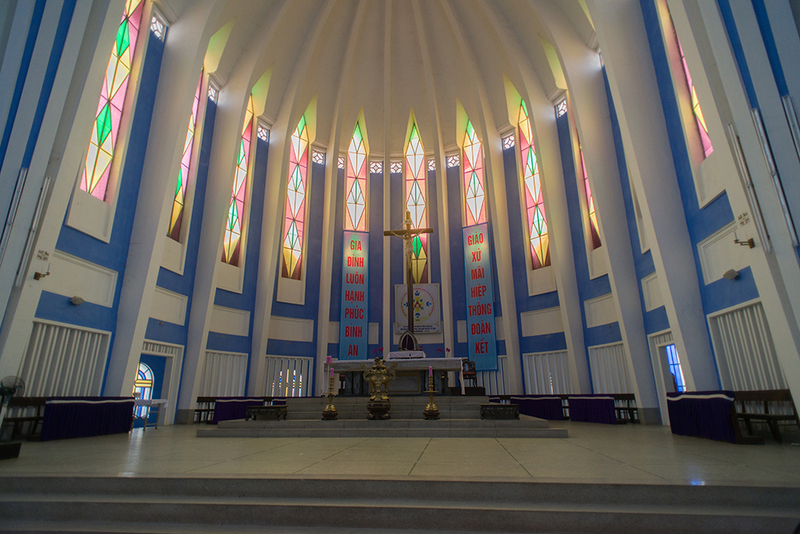 We saw one of the largest Catholic Churches in the area, Our Lady of Perpetual Help. There again the children came running to me and asked my name, I have some video and will get that posted when I return to the states. The interaction was heartwarming, I asked each their names, tried to pronounce them, asked what grades, their favorite class (English came on the list as the worst class). I told them I was a teacher and they should study hard and be smart. Traffic here is unbelievable, no pedestrian laws, just run like hell, it is a free for all. After dinner I got lost in the neighborhoods, took a while and some walking but made my way back safely. Today we began with breakfast overlooking the City of Hue. I remember very little from here, and certainly don’t remember the streets and houses that exist today, of course it has been 47 years. This was mostly rice paddies when I was here in 1968. 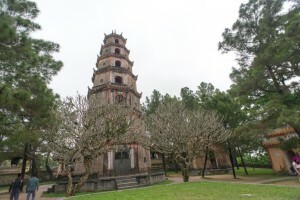 We began with a walking tour of the battle of Hue at TET in 1968. This was the MACV compound. I look around and really don’t remember, that is the most frustrating part. The first hand-to-hand combat of the war took place here on this street. 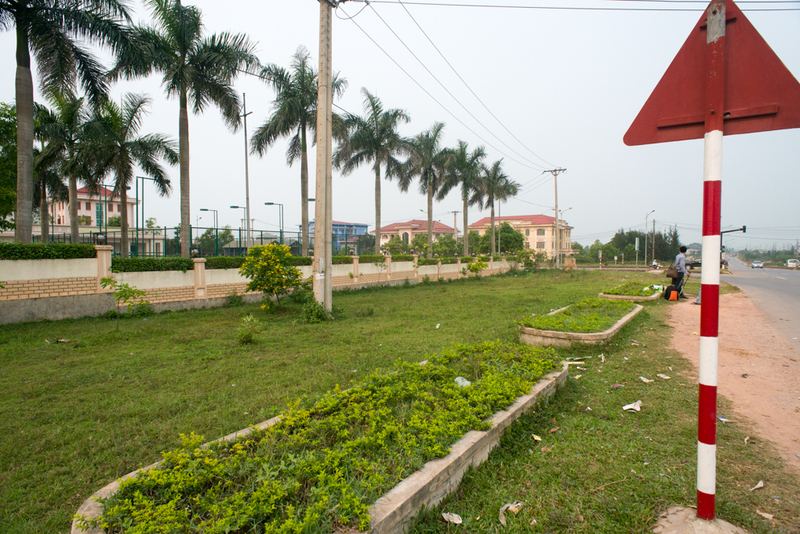 As it progressed, the Marines battled in what now is Hue University. 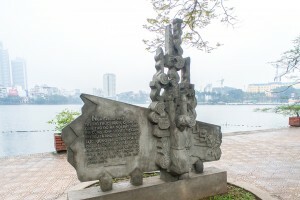 In the early morning hours of 31 January 1968, a division-sized force of North Vietnamese Army (NVA) and Viet Cong (VC) soldiers launched a well coordinated multi-pronged attack on the city of Hue. Their targets were the Tay Loc airfield and the 1st ARVN Division headquarters in the Citadel, and the MACV compound in the New City on the south side of the river. Most of Hue’s citizens had initially locked themselves in their homes, but now thousands began to stream into the MACV compound. Five thousand refugees gathered at the liberated Catholic Church, while another 17,000 accumulated at the university. When the mayor of Hue and the ARVN forces proved unable to adequately process and care for them alone, Da Nang dispatched a platoon from the 29th Civil Affairs Company to assume control of the humanitarian effort. The ensuing 26-day effort by the U.S. Marines, U.S. Army and ARVN to recapture the Citadel. 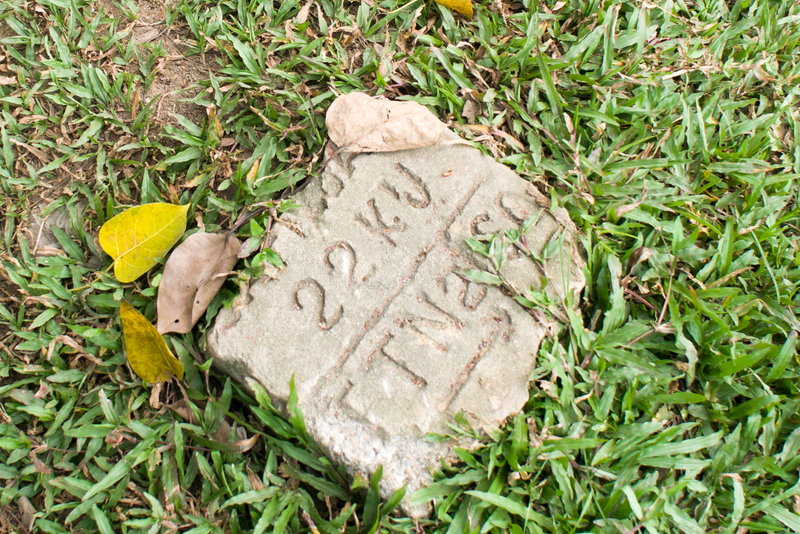 I found this marker in the ground just 50 yards from the Dong Ba Gate, I don’t know what its significance is. Sometimes is pays to look at the ground around you. We toured the Citadel, inside the Imperial Palace. 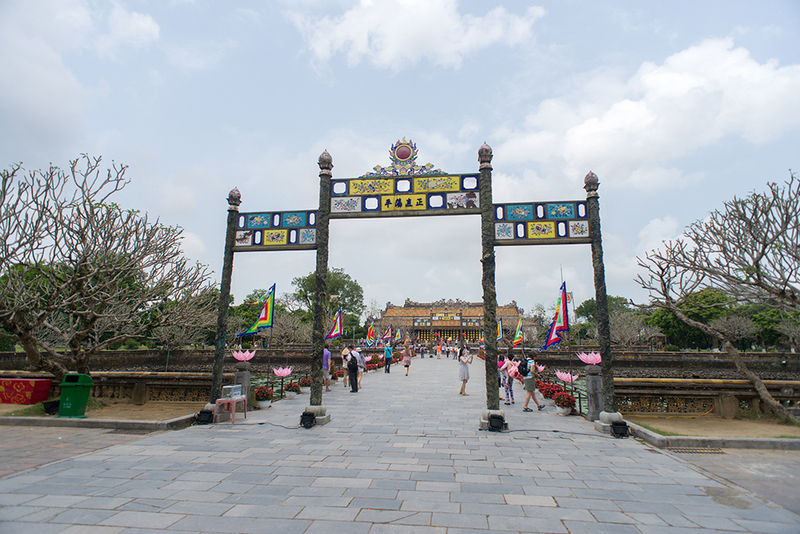 The Imperial City is a walled fortress and palace in the city of Huế, the former imperial capital of Vietnam. The grounds of the Imperial City are protected by fortified ramparts and ringed by a moat. 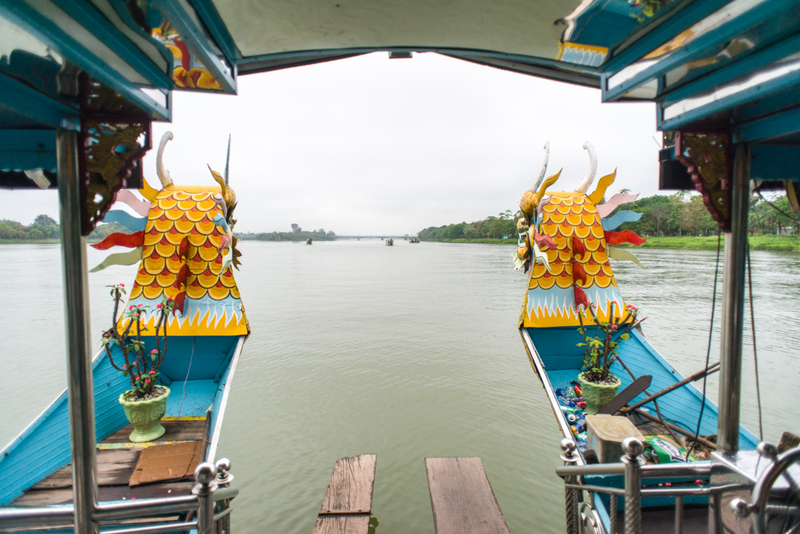 The water in the moat is routed from the Perfume River through a series of sluice gates. This enclosure is the Citadel. Inside the Citadel is the Imperial City with a perimeter wall. 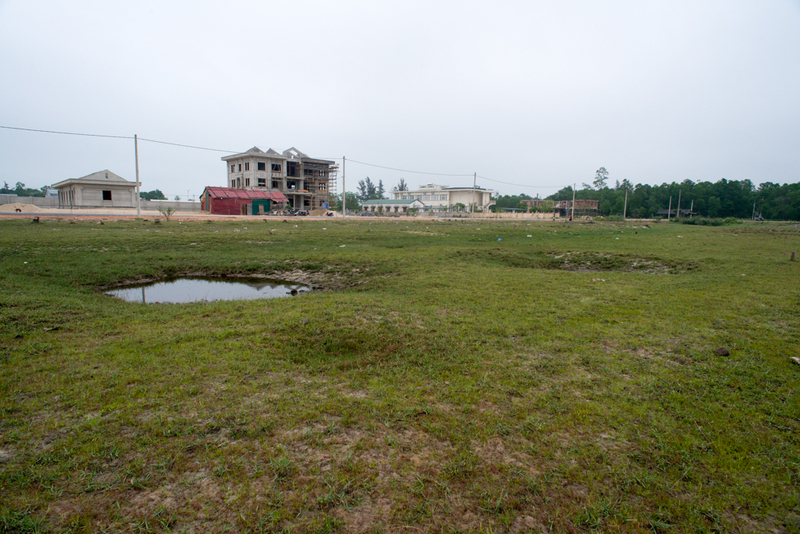 Within the Imperial City is the Purple Forbidden City and at one time had many buildings and hundreds of rooms. It suffered from termite and cyclone damage, but was still very impressive. We wound up the day, hot, sweaty and anticipating the journey to the north, to Quang Tri and Dong Ha. 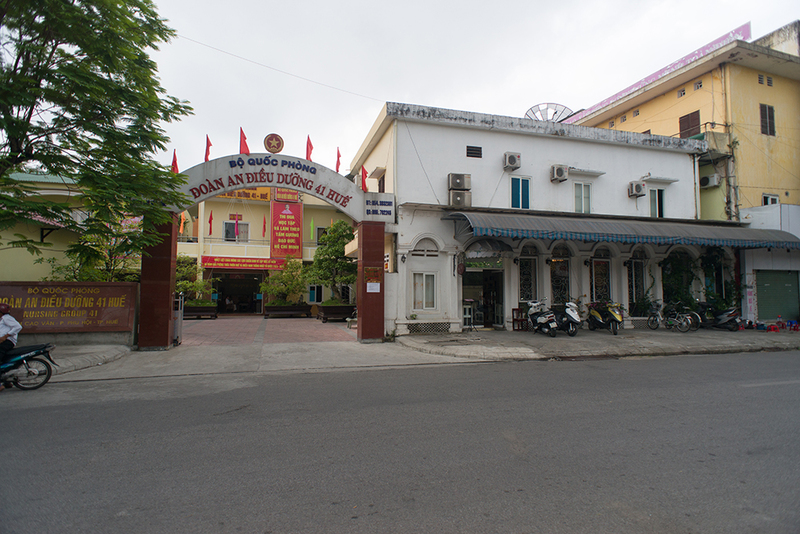 I leave the city of Hue, unable to find the site of AFVN in Hue. 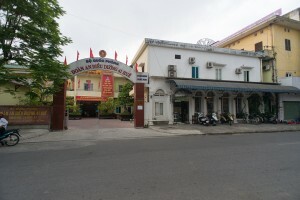 The address, 6 Tran Duc Street does not exist. This is a problem we will no doubt encounter as this adventure continues. It has been 47 years, things change, so do people. Today I met a former NVA soldier, we talked about our service, not a long conversation thru an interpreter, but we both shook hands, respecting each others place in 1968 and now today. Enemies at one time, now friends today. He was so proud to show me his medals I know for many this may seem really insignificant, but to me, it was a great moment in my life to meet this man. The day included a very long boat ride up the Perfume River. 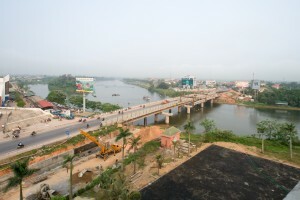 The Perfume River is a river that crosses the capital city of Hue, in the central Vietnamese province of Thua Thien Hue. Perfume or Huong River owes its name to the fact that it flows through many forests of aromatic plants before reaching Hue, bringing with it a pure and fresh aroma from fallen leaves and flower petals. One of the places we stopped at got off was at this pagoda. The Thien Mu Pagoda has a peaceful air, with pine trees and flowers, monks wandering around. This is an octagonal seven-level pagoda. The steps are a killer, from the river there were 50 steep stairs, then another 80 to reach the pagoda. Lots of chickens running around. And of course tourists. The morning would conclude with a trek up a very steep jungle trail. I honestly had flashbacks with the very near 95 degree temperatures, the forestation and this jungle canopy. It is amazing how some sensory things can bring back memories, both good and bad. 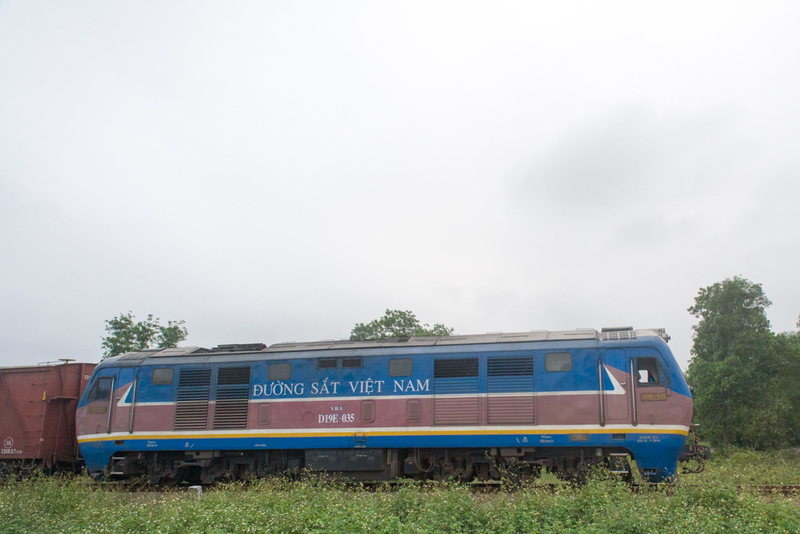 Those who know me know that I have a fascination with trains and today I got to see one heading north from Hue. We kept pace with it for a while, video to come later. I think most of the Seabees on this trip think I am nuts. 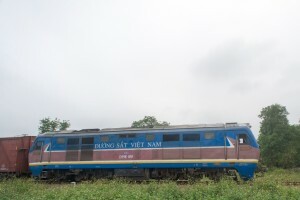 DSVN (Duong Sat Viet Nam) runs an extensive system across the country with a route linking Hanoi with Ho-Chi-Minh (Saigon). Various other lines head out of Hanoi to Haiphong, two lines run to the Chinese border, northwest to Lao-Cai and northeast to Dong Dang. Another line runs to the tourist town of Halong. These lines have a mix of gauges with Narrow Gauge and Standard Gauge. Some places and depots are dual gauged. Here you can see a bridge spanning highway 1 near Quang Tri as it was in 1968, and here is what I looked like today. 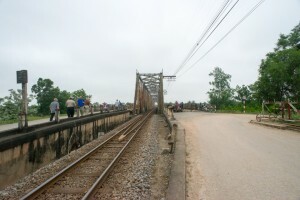 Bridge to quang Tri, this bridge replaced the one I traveled on. 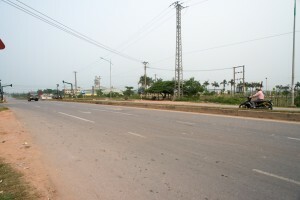 In 1968 Quang Tri City was a small market town and the capital of Quang Tri Province, the northernmost province of South Vietnam, bordering North Vietnam to the north, and Laos to the west. 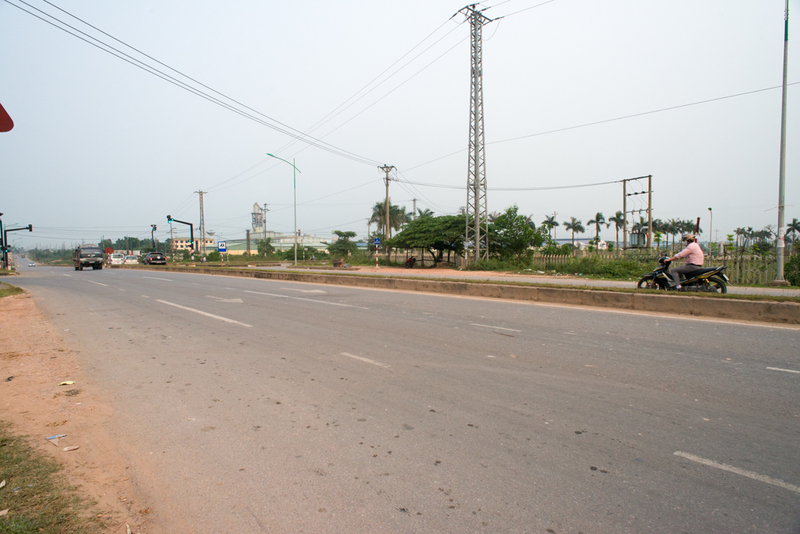 Like the old imperial capital at Hue, Quang Tri City is located on Route 1. It is about 6 miles inland from the South China Sea. 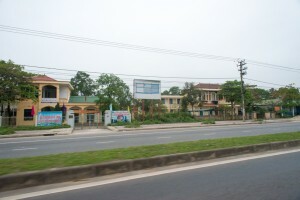 Because Quang Tri City was an important symbol of South Vietnamese government authority and was the most vulnerable provincial capital in South Vietnam, it was a prime target of the North Vietnamese during the 1968 Tet Offensive. The North Vietnamese had briefly overrun and occupied the City 10 months earlier, on April 6, 1967. Today we found what is the footprint of the Quang Tri Airbase, we walked the area, found several what appear to be bomb craters. In this picture I think, if my memory serves me correctly, this was where helicopters were stored and maintained. I have a slide of them and some others of the airbase I will have to find and digitize when I return to the US. 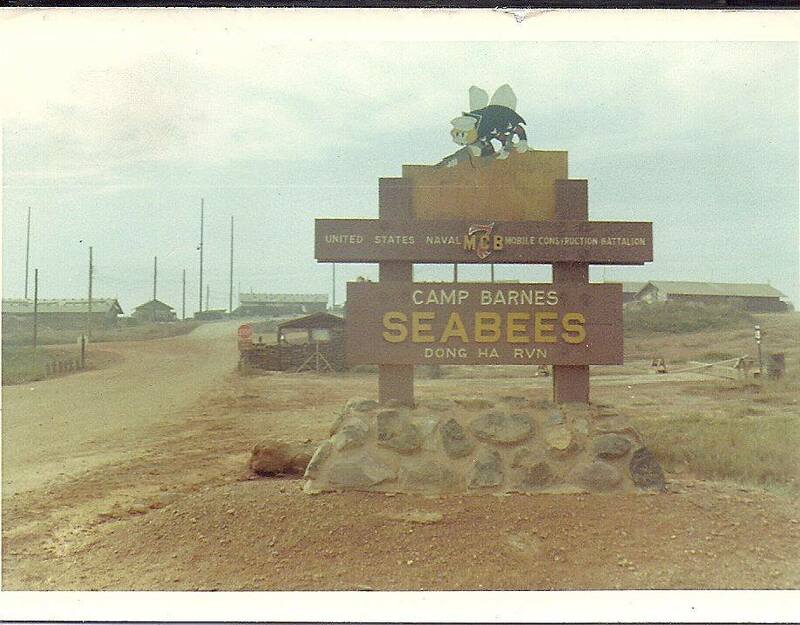 This is what would have been the Seabee combat base at Quang Tri. 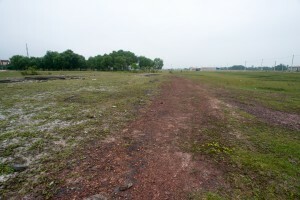 The day concluded with a search for the CBMU 301 base near the airport. It appears we have found it, but now is a housing area. It might pay us to walk some of the streets and search for clues to the camp. We are all so exhausted today, tomorrow is going to be another grueling day. A day filled with frustration, excitement and discovery. 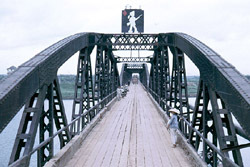 Departing early this morning, walked across the Dong Ha Bridge (destroyed by John Ripley which stopped the initial NVA advance during the 1972 Easter Offensive). The traffic is so fast and noisy and dangerous. 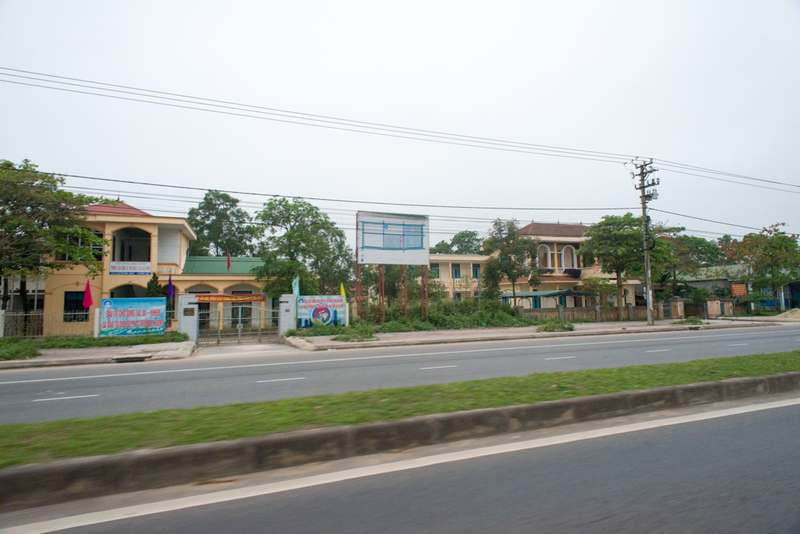 We passed through the villages of Mai Xa Chanh and My Loc. Then we stopped at the bridge that connects North and South Vietnam, we crossed over on foot and stopped at a museum on the northern side. 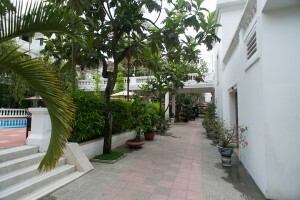 In the new town of Cua Viet there is lots of new development along the beach. 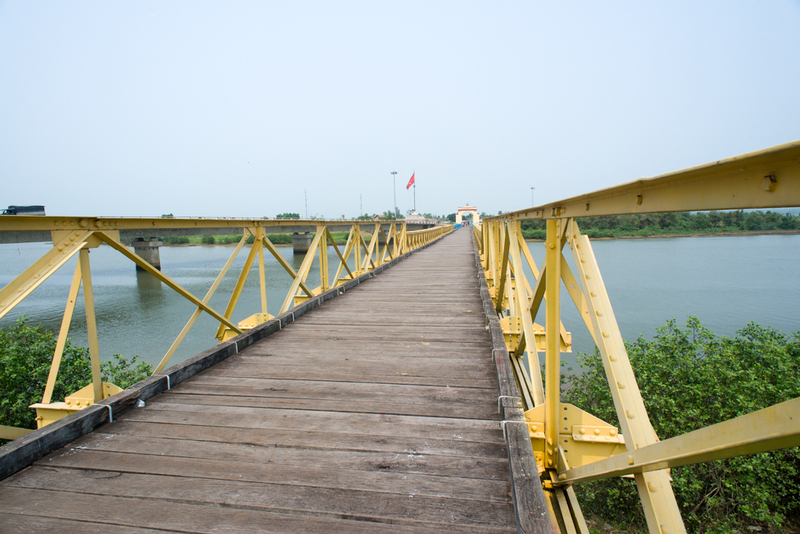 We then crossed over the new bridge to the south side of the river to visit the site of the Cua Viet Port Facility. 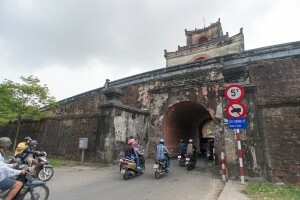 We took the beach road north and crossed into North Vietnam over the Song Ben Hai, the river that was the only true physical demarcation between the North and South. We then explored the tunnel complex in the NVA artillery village of Vinh Moc. The complex is vast, small and dusty. Several brave Seabees went down into them. 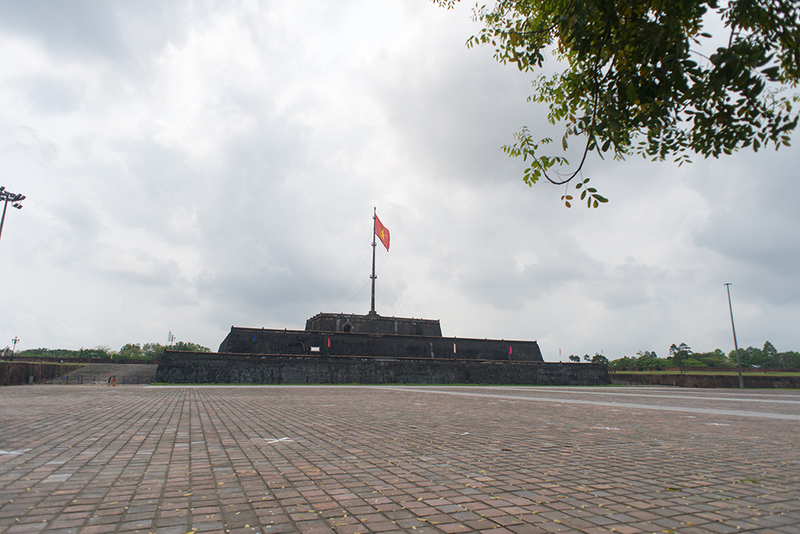 During the Vietnam War it was strategically located on the border of North Vietnam and South Vietnam. 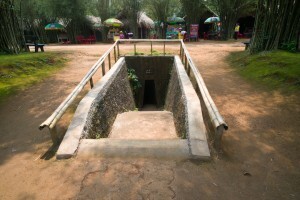 The tunnels were built to shelter people from the intense bombing of Son Trung and Son Ha communes in Vinh Linh County of Quảng Trị Province in the Vietnamese Demilitarized Zone. 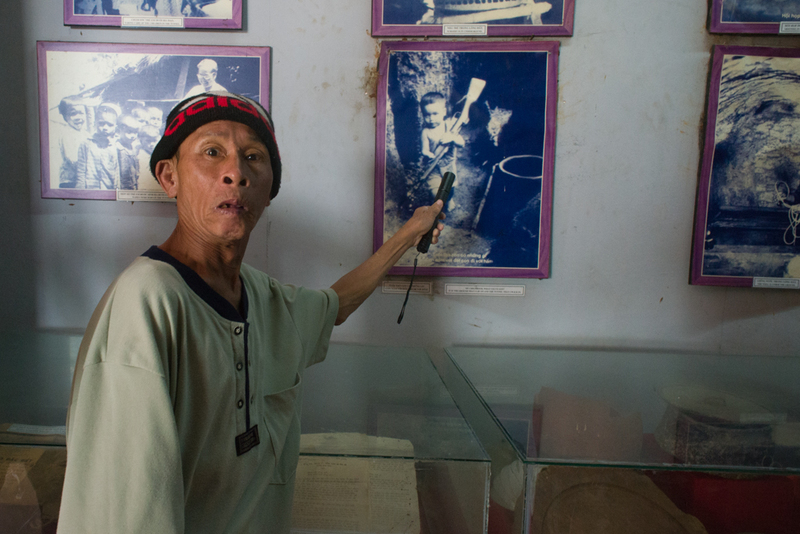 The American forces believed the villagers of Vinh Moc were supplying food and armaments to the North Vietnamese garrison on the island of Con Co which was in turn hindering the American bombers on their way to bomb Hanoi. The idea was to force the villagers of Vinh Moc to leave the area. The villagers initially dug the tunnels to move their village underground. 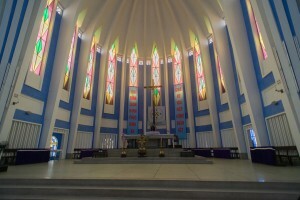 It was constructed in several stages beginning in 1966 and used until early 1972. He was born in the tunnels and is showing a picture taken of him. 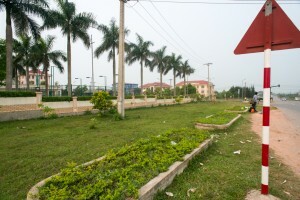 The complex grew to include wells, kitchens, rooms for each family and spaces for healthcare. Around 60 families lived in the tunnels and as many as 17 children were born inside the tunnels.We met a man who was actually born in the tunnel, he showed me a picture taken when he was a little boy. We enjoyed a light lunch then back on the road to find the bases at Dong Ha and also AFVN at Camp Devil. On our return from the North, we made a stop at Gio Linh FSB Forward (Alpha 2) located on the forward edge of the DMZ on the south. 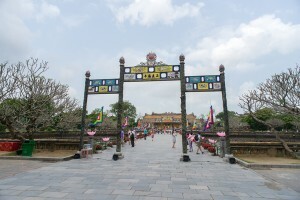 Next we visited Con Thien (the Hill of Angels), and stop at the Cam Lo Bridge. 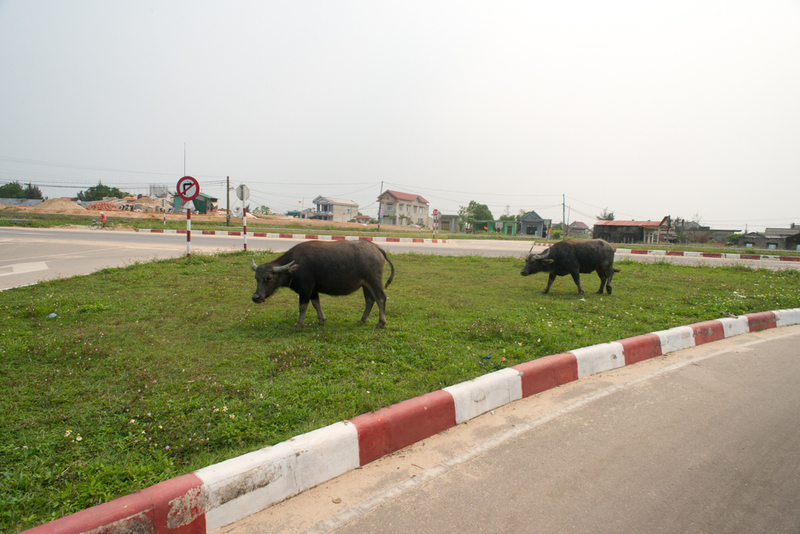 There are water buffalo everywhere, when we were here in 1968, if we killed one of the buffalo we had to pay the owner $75. 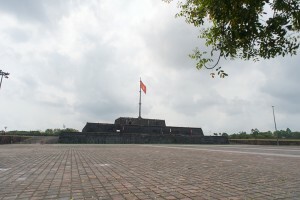 Site of the Dong Ha Combat base. Today it is all housing. 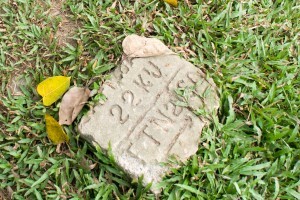 We returned to Dong Ha to search for the location of Camp Spillman and Camp Barnes. This proved to be difficult because there is now a city where the camp once stood. We had placed overlays of the camps onto Google maps, so we had some idea where they were, but with no landmarks, several street name changes and memory, it was difficult. We all remember the runway at Dong Ha, it ran almost east and west. That was our starting point. We found what was the runway, now a city street. Dong Ha Combat base, we thing these is close to where the Red Barn was located. We stood at a rise in the land, we believe it is where the two camps, Spillman and Barnes met. So we paused for a moment of prayer for those who were killed here, posed for a picture and then headed to find another location I was at, Armed Forces Vietnam Radio, Detachment 5 at Quang Tri, Camp Red Devil. Stay tuned for the story of how we found AFVN..